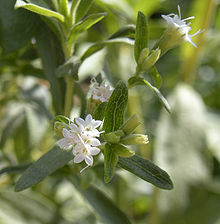 If you’ve ever tasted stevia, you know it’s extremely sweet. In fact, this remarkable noncaloric herb, native to Paraguay, has been used as a sweetener and flavor enhancer for centuries. But this innocuous-looking plant has also been a focal point of intrigue in the United States in recent years because of actions by the U.S. Food and Drug Administration. The subject of searches and seizures, trade complaints and embargoes on importation, stevia has been handled at times by the FDA as if it were an illegal drug. Since the passage of the Dietary Supplement Health and Education Act (DSHEA), stevia can be sold legally in the United States, but only as a “dietary supplement.” Even so, it can be found in many forms in most health-food stores, and is also incorporated into drinks, teas and other items (all labeled as “dietary supplements”). It cannot, however, be called a “sweetener” or even referred to as “sweet.” To do so would render the product “adulterated,” according to the FDA, and make it again subject to seizure. The purpose of this site is to provide as much information about stevia as possible, from the scientific studies regarding its safety to the petitions submitted by the Lipton Tea Company and the American Herbal Products Association. Body Ecology is dedicated to providing you with the essential information you need to take charge of your own health and well being — including keeping you apprised of where to obtain the highest quality products to go along with the Body Ecology Diet (BED) system of healing. BED’s titles include The Magic of Kefir, The Stevia Story, and our landmark book, Donna Gates’ Body Ecology Diet, considered ‘must’ reading for anyone who wants to improve his or her immune system. For more information on the Body Ecology system, please visit our BED home page at bodyecology.com. You will also find products there that accompany the BED diet, including organic, unrefined oils, probiotics and dietary supplements.